Since we’re now only about fourteen weeks away from the release of Lord of Runes, published by Tor and Paizo, it’s time to get something straight. You do not need to have read any of the previous Radovan & the Count stories to start with Lord of Runes. You really don’t! Honest. I am not messing with you on this. However, experience suggests that some of you just won’t believe that, or you’ll believe it but you’ll still want to start from “the beginning,” which is a tricky thing to define with the boys, since I’ve written a few flashback stories. If you want to catch up on the boys’ adventures, I suggest you tackle them in publication order. In this post and a bunch to follow, I’ll guide you through that order. Start with Hell’s Pawns, originally published as the Pathfinder Journal in the Council of Thieves Adventure Path. This is the first Radovan & the Count story, and it’s unique in a couple of ways. First, it’s told in present-tense, because I’d been binging on film noir and saw Radovan as a sort of hard-boiled detective type. Sure, the elevator pitch has always been “Holmes and Watson meet sword & sorcery,” but that’s not a very good way of describing the actual personalities of the characters. “Holmes and Marlowe” makes more sense, but only if you know what that means, and many don’t. Second, it’s strictly Radovan’s point-of-view. I’d originally conceived the story as alternating between the boys’ points-of-view. Once I got down to writing, however, I felt the story didn’t have enough space to divide it among the two protagonists. For that structure, I wanted to wait for the extra space a novel affords. Also, I didn’t start to hear Varian’s voice until the third or fourth time I rewrote the early chapters of Prince of Wolves, which is a tale for another time. Hell’s Pawns is the published story I’d second-most want to revise for a couple of reasons. I hadn’t quite found Radovan’s voice yet, and I would love to expand it to show the same investigation from Varian’s POV. There are two ways you can read Hell’s Pawns. You could buy all of the Council of Thieves Adventure Path, which would cost about $120 and which I recommend only if you want to run that AP (it’s good, and it was the first AP designed for the Pathfinder RPG rather than D&D 3.5). Alternatively, you could buy the .epub version for $5. That might seem a trifle high compared to the cost of the novels, but these novellas are lavishly illustrated, so that’s a bonus. Anyway, I always fear that people going back to Hell’s Pawns after reading the novels may be disappointed by the different style and the single POV, but a surprising number of readers cite it as their favorite. It’s the first and so-far only look at Varian’s house in Egorian, not to mention the capital of Cheliax itself. There are several characters there who remain near to my heart and who I’d probably revisit if I were to write a novel set there. Fun facts: Radovan was originally a half-orc, but someone else had already pitched a story with one, so James Sutter suggested a hellspawn as an alternative, thus earning his keep in a single stroke. Also, Radovan’s name was Sabuto, and he was half-Tien rather than Ustalav. The original story pitch, which I changed substantially before writing, included a vampire. I really wanted a vampire. Thus, I introduced one later, although it became a very different sort of vampire. Now go! 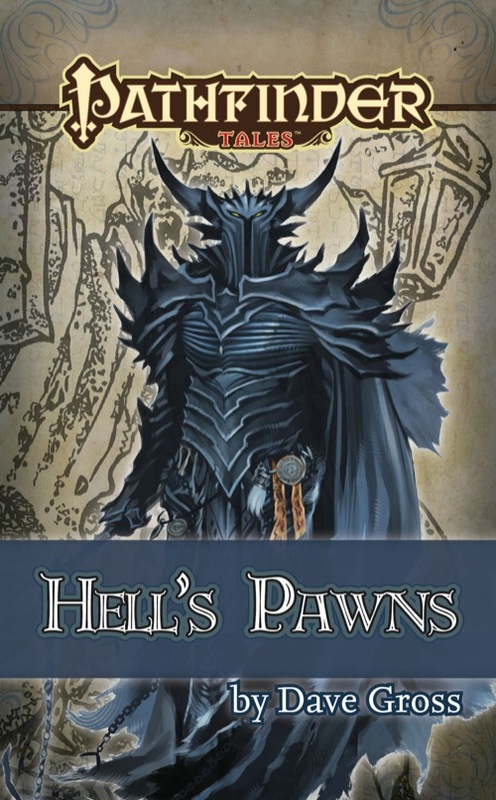 Read Hell’s Pawns, and then come back here (or go to Paizo or Goodreads) and tell us what you think of it. P.S. Now is a good time to sign up for the newsletter that I’ll likely send in May or June. There could be a giveaway involved. This entry was posted in Writing and tagged Pathfinder Tales, Radovan & the Count, Radovan & the Count Reread by Dave Gross. Bookmark the permalink.